It all is really just a game. 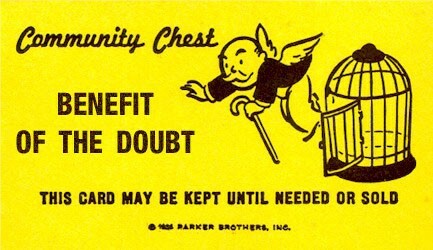 The definition of the word doubt means to be uncertain about (something): to believe that (something) may not be true or is unlikely. I find it interesting on how different people present their ideas, especially in a corporate setting and when also presenting to “execs” or management as well as the differences between when men and women share their ideas up the food chain. Words are important, and nothing breeds confidence in you, your pitch, your ideas more than when you both know what you are talking about also know how to present it with certainty. The nuance is subtle. But it’s important. Especially when pitching or when presenting to a group. I see more women than men struggle with this when presenting ideas. I’ve had one or two of those phrases come out of my mouth in my career. I know these phrases come from the voice inside your head that can be full of self-doubt but also come from the tendency for women to demote their own ideas first so that others can’t tear them down or belittle them. Like Sara, I agree that a smile goes such a long way. Start with a thank you. Practice — write down your talking points in a notebook and have it there to also jot down any important phrases you hear from others, especially your boss. Brevity, I am working on this, listen more than you speak. If you are presenting, have someone else take notes so you can be present and think on your feet. Breathe and slow down. You don’t have to answer immediately, smile, take a breath, repeat the question back as the beginning of your answer. In coaching others and continuously working on my pitches, presentations I work on getting this language out of the vernacular. Give a listen to see how much doubt language swirls around in our world. It’s there more than you think. Older PostThe truth sometimes hurts but one must publish.